It was a bit of a selfish Christmas present giving my husband a pair of tickets to the Williams Conference Centre because I’ve personally always wanted to visit the home of Williams F1. Luckily he picked me as his guest and we had a fascinating time last Saturday. Located not far from Oxford, Grove is synonymous with Williams F1 these days, having been the home of the British F1 team since the mid-nineties. We were welcomed through security, told where to park and directed to the conference centre through falling snow where our security badges (on very cool Williams Martini Racing lanyards which were ours to keep) and a warm welcome awaited. 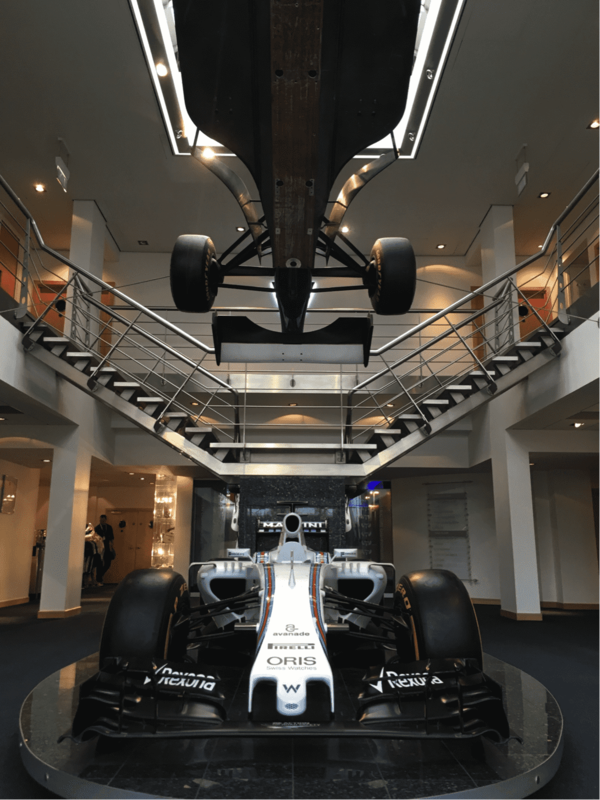 The lobby was impressive with Massa’s 2015 F1 car parked in the centre, as a Rothman’s vintage model dangled above from the ceiling. 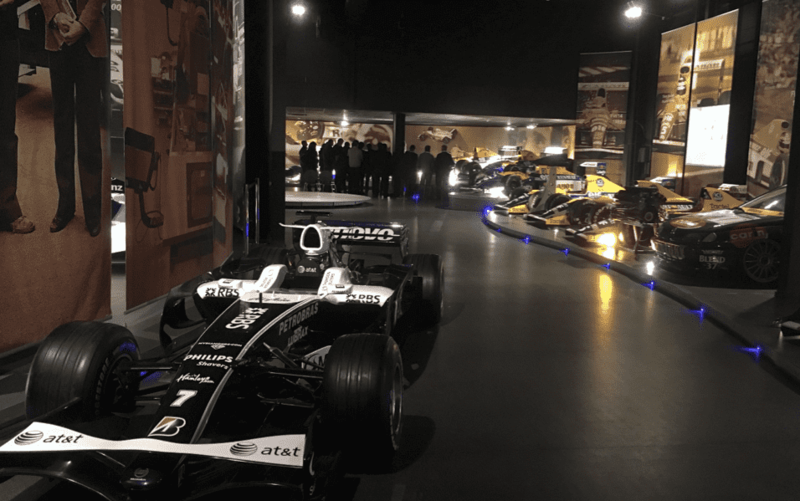 Williams run all their Grand Prix Collection tours on Saturdays, with an earlier tour starting at 10:15 and finishing with lunch at 12.30, or a later arrival at 12:15, which we opted for. We were invited to have a wander and help ourselves to tea, coffee, and juice in the hospitality area, before a hot lunch complete with a choice of puddings. My husband had fish pie, I had mushroom and butternut squash lasagne, and we both went for banoffee pie. The tour kicked off after lunch as sixty F1 fans of various ages were ushered back to the lobby for introductions. Being a larger than normal group we were split into three smaller groups, all led by incredibly personable, knowledgeable Williams personnel. Our first port of call was the trophy room where – you guessed it – all the team trophies are on display along with the helmets of all past Williams drivers. We got to play around with Pastor Maldonado’s steering wheel and threw Nico Rosberg’s incredibly light driver’s seat around as our guide explained the technology behind carbon fibre engineering and talked telemetry, pneumatics and driver safety. Best stat of the day: Williams cars evolve and update three times every hour of every single day. By the end of a F1 race, the car has been improved up to twelve times. Onto the champions’ gallery – a hall of fame where our guide shared a short history as well as a few funny tales about Williams’ best loved faces – and through to the Preview Room for a short film narrated by Frank and Claire Williams about the coming together of Sir Patrick Head and Sir Frank Williams. We then moved onto the Grand Prix Collection, the largest private collection of F1 cars in the world. Arranged in chronological order, we started with the FW1 and were escorted with insight, facts and stats through the history of Williams and its iconic driver line up over the past forty years. Watching the cars evolve visually was interesting as the cars widened and became more curvaceous, losing the front wing altogether in the early eighties (such an odd look and not a successful one either) before arriving at their most current incarnation. This year Williams celebrates 40 years in F1. The car for 2017 should technically be the FW39 but Sir Frank and co have taken the executive decision to skip a number and make Massa and Lance Stroll’s car this season the FW40. Pretty cool! The day ended with a chance to visit the gift shop and time for another coffee before heading home. Tickets for the Williams Grand Prix collection tour cost £60 each and can be booked online at WilliamsF1.com.